Tool makers since 1884 - When only the best will do. These new design tuning heads are made to fit both Schaff tuning hammers and Hale Tuning Hammers. High polished stainless steel head comes in various length and pitch angles as shown. 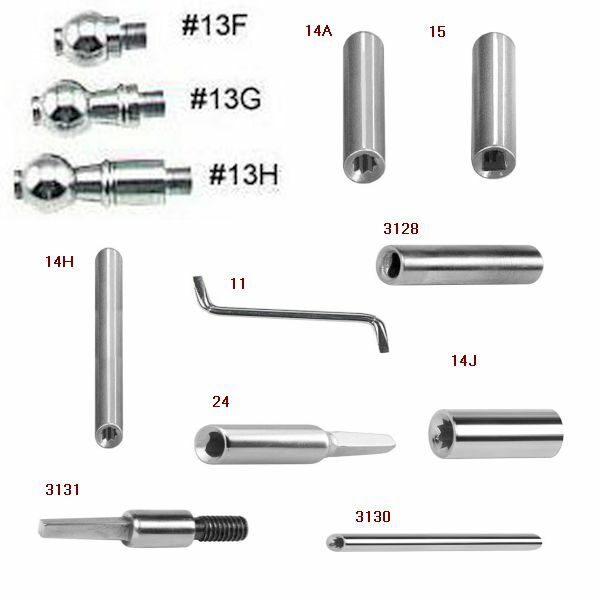 Made from high-quality chrome plated tool steel, these tips are 1" in length and will fit any Schaff #13 series head. Screws into all tips. Square and fits into star tip. Enables you to quickly change tips to gain height over bearing bars, or to reach inaccessible locations. I was extremely happy to find an adapter for tuning hammer that would fit an 1870's Decker Bros. square grand with oval keys....at a very reasonable price. Thanks so much folks! Schaff is a great company and their products are amazing. The vandaking service and attention is perfect, fast international shipping. I needed a tuning lever tip for an 1876 Erard, and Schaff had just what I needed. I had to order another approximately $4 to meet the minimum amount, but that was OK, as one can always use another polishing cloth!